I fully realize that Delta Decals is not a house-hold name to many of you, but those of you who have sampled some of their offerings over the last few years have probably been quite pleased with what is provided. 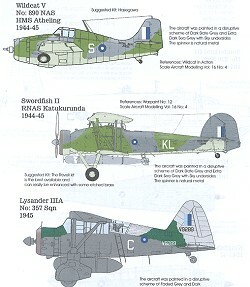 This sheet is for South East Asia RAF types; mostly in the last years of the war. It was during this period that the SEAC roundel was in use. This roundel removed the red (to prevent confusion from the Japanese Hinomaru), enlarged the blue area and in some cases, replaced the white portion with a lighter blue. 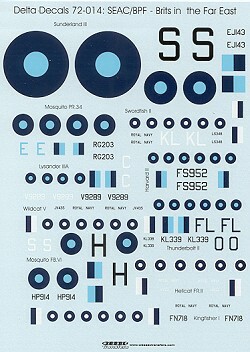 On this sheet are markings for ten different aircraft. I've shown just a few from their instruction sheet. The instructions are in full color and provide recommended kits for each of the options. These are generally the newest kits available (Hasegawa/Tamiya/Academy) but no reason these wouldn't work on the older ones (Airfix/Heller/Revell). Decals themselves are superbly printed by Wessex Transfers (sounds like a bus line), and should work very well on your next model. Do something different and give these a try. My thanks to Delta Decal for the review sheet. If you can not find these locally, check their web site for more information on ordering direct.